The Concept is Simple. The Details are critical! What's Lurking in the Back Corners? And How Long Has It Been There? This is One Way to Organize! Can racks of various kinds have been around for a long time, but how many of them actually function properly? You may have tried the refrigerator racks for soda pop; you know, the kind where the cans lock-up at the back end. Our rack designs consider all of the things that can go wrong and the details are coordinated to provide free flow of the cans under all loading conditions. Don't waste time and material experimenting. We provide user tested, professionally detailed drawings and instructions. The racks are built from simple, inexpensive materials, available at your Home Center. A table-saw is suggested for cutting materials, but cutting can be done with a circular saw or even by hand. 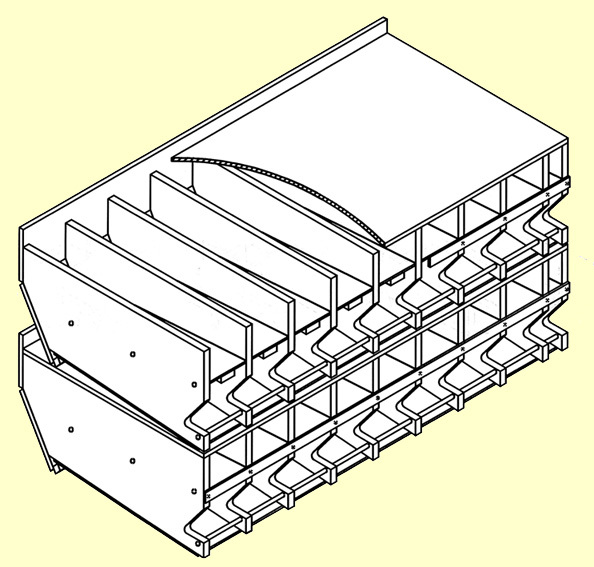 Material for the construction of a 4-cell rack, to store 52-three-inch diameter cans (the most common size), will cost as little as $15.00. 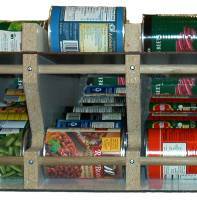 A typical small pantry, behind a door 2'-0" wide by 6'-8" high, with 24" deep shelves, can accommodate about 400 cans of food, in various sized cans. All visible, easily accessed and automatically rotated. 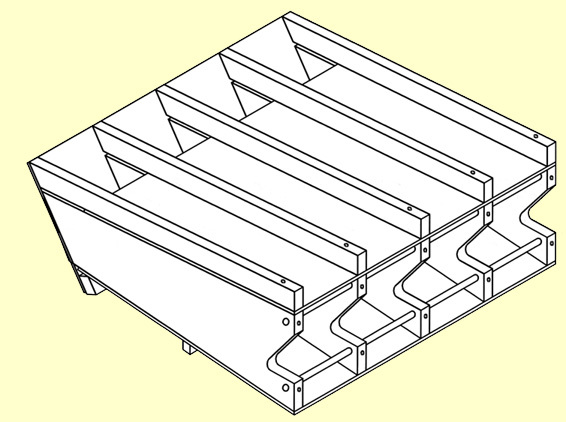 For serious food storage, the S-series racks are stackable & occupy a floor space 24" x 48". They can be stacked a maximum of 5-units high (or 6'-0" max height). A typical bank will hold over 800 cans of various sizes. A weekend's work could have your system in operation. Standard Plans $14.95 1st Class Postage Paid! 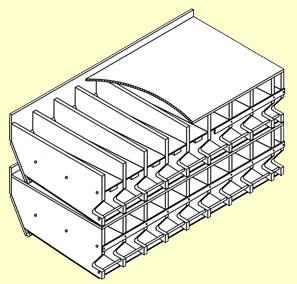 Horizontal Rack Plans. To be placed on shelves. Height is the minimum clear distance between shelves. 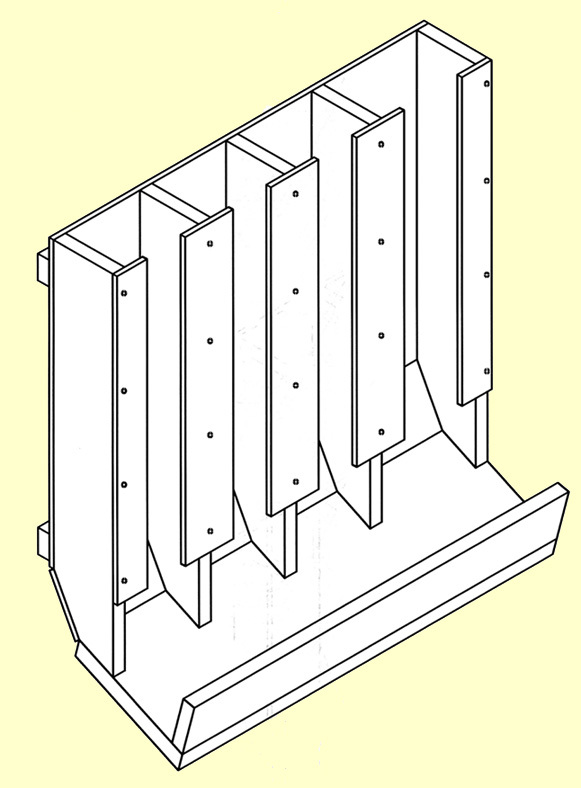 To be placed adjacent to and attached to a vertical support. May be stacked up to six-feet high. 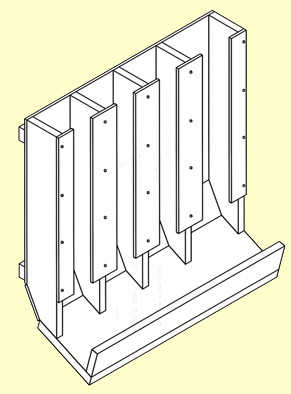 Vertical Rack Plans. To be hung on a substantial wall. 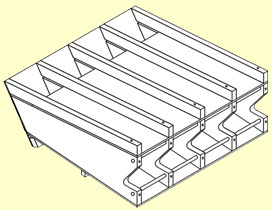 Projection is the distance from the wall to the face of the tray. *Most of your canned goods will fit in the 262 sized racks.